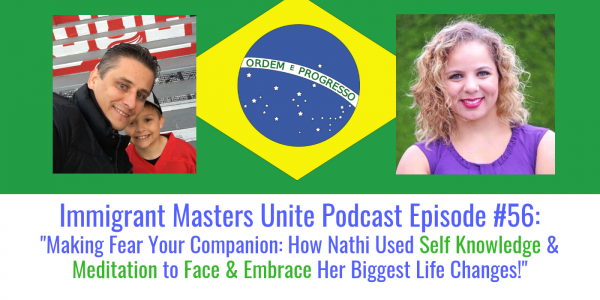 IMU 056: Making Fear Your Companion: How Nathi Used Self Knowledge & Meditation to Face & Embrace Her Biggest Life Changes! | Immigrant Masters Unite Podcast: Transform Your Business, Life and The World Around You! Does fear ever cripple you? Does change feel more daunting than exciting? This is Polish Peter, and welcome to Episode 56 of Immigrant Masters Unite. Today, I have Nathi Eustaquio from Brazil. An avid advocate for women’s’ rights and a proud immigrant, Nathi is the founder of “Empowering Immigrant Women”. During her years as a counselor, Nathi found all the instruments and techniques that combined with her experience as an immigrant were the perfect recipe for understanding the struggles lived by immigrant women. Her passion became to help women thrive and remind them how powerful they are. The passion for feeling empowered and never stopping to learn made Nathi face her fears, start traveling and create her own business. Her love for art inspired her to paint and play the ukulele. You can often find her on a beach in Hawaii, soaking up time with her hubs.